The Marantz HD-CD1 features a stylish solid aluminum front panel, double-layer chassis for vibration isolation and retro-style side panels. It also includes a high-quality integral headphone amplifier with adjustable gain to drive high-end headphones for personal listening and comes complete with a remote control for all its functions, also able to ‘drive’ a complete system of HD-CD1 and HD-AMP1. 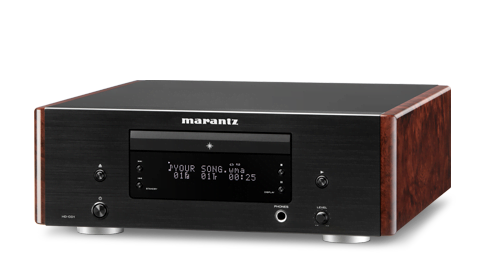 The Marantz HD-CD1 is a high-quality CD player in the same compact form as the HD-AMP1 amplifier, for which it is the perfect match. Combining more than 30 years of Marantz expertise in compact disc playback with the latest developments in digital audio technology, it’s ideal for use as a CD transport when used with the HD-AMP1, or as a CD player in any situation where a compact form-factor is required without any compromise on sound quality. 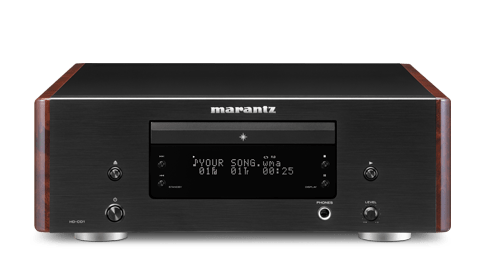 The Marantz HD-CD1 makes use of state-of-the-art technology carried over from their Award-winning CD players, including a high-resolution 192kHz/24-bit digital-to-analog converter, a high-accuracy system clock, and the famous Marantz HDAM-SA2 amplifier modules, as found in Marantz flagship Reference Series CD players and amplifiers. Selected components are also used throughout the audio signal path, for the very best reproduction of your music. A centralized CD mechanism, able to play MP3, WMA and AAC files as well as standard CDs, is also used for ultra-accurate disc-reading and, along with its analog audio outputs, optical and coaxial digital connections are provided, allowing the HD-CD1 to be connected directly to the HD-AMP1’s ultra-high-quality digital-to-analog conversion. 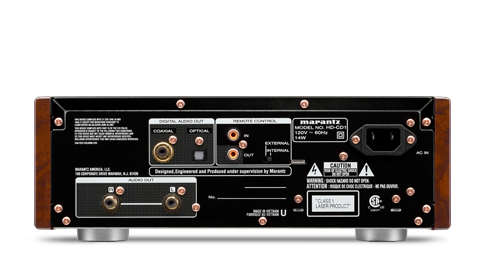 The Marantz-designed HDAM Hyper-Dynamic Amplifier Modules are found in Marantz products all the way up to the Reference series players and amplifiers. These miniature amplifiers are built from separate, optimized components for the very best sound quality. The latest-generation HDAM-SA2 version of this technology is used in the Marantz HD-CD1, to provide a wide dynamic range and wide frequency response with lowest distortion, to get you closer to the music. HDAM technology is also used in the headphone section, which has its own dedicated amplification. Central to the sound quality of the Marantz HD-CD1 is a high-quality CD transport mechanism, designed for ultra-accurate disc-reading, and this sends data to the player’s high-resolution digital-to-analog converter, which is found in top-flight digital hardware. This is used together with a crystal oscillator master clock designed for ultra-low phase noise, and a low impedance capacitor, also designed for low noise, ensuring digital data is converted into an analog sound with lifelike dynamics and timbre, breathtaking presence and sheer musicality. Whether you want to use the HD-CD1 on your desk for full-time headphone listening, or just occasionally want to connect a pair of headphones for a private music session, the dedicated headphone section in the player will delight. To make the most of personal listening, it has its own volume control and a dedicated HDAM-SA2 amplifier, complete with adjustable gain setting—low, medium and high—to enable it to drive even highly-demanding audiophile headphones. As well as its own high-quality analog outputs, the HD-CD1 has both optical and coaxial digital outputs, meaning it can be used as a CD transport straight into the digital input on the HD-AMP1 and allowing it to be used with the superb ESS Sabre DAC built into the amplifier. Like the analog outputs, the coaxial digital connection uses a high-quality gold-plated RCA socket, and a digital cable is supplied with the player. Noise is the enemy of great sound, and the Marantz HD-CD1 has extensive measures to suppress both electrical and mechanical interference. A high-current power supply with high-capacity storage capacitors is used to ensure the player is able to deliver the dynamics of music, along with high-speed Schottky Barrier Diodes. The player also has auto-standby and very low power consumption when in standby mode. The Marantz HD-CD1 is built on a double layer base-plate for rigidity and vibration suppression, aided by the use of compliant feet, a solid aluminum fascia and a rigid top-plate, and is finished with retro-style side-cheeks for that ‘classic Marantz’ look. The remote control handset supplied with the Marantz HD-CD1 controls all the functions of player, and can also ‘drive’ the matching HD-AMP1, for simple system integration and convenience.